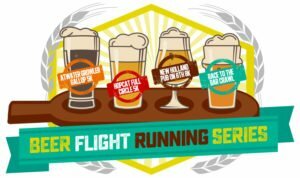 The Beer Flight Running Series is taking a trip out to Holland to race at New Holland Brewery and Pub! This is the third race in the series, and we are going to up the distance a bit here in June. This 8K course is both scenic and fast. Just like the first two race in the series, beer will be pouring as you are finishing the event and we will also have live music playing. All races in the series have a different unique finishers glass. If you finish all four events, you will be given a finishers paddle at the end of the season on which to display your glasses! There is plenty of parking in lots and along the street throughout downtown Holland. Make sure that you show up early so you have enough time to get your packet and back to your car if needed! One free craft beer from the great folks at New Holland Brewery! 1 of 4 finishes needed to qualify for the series paddle! Awards to the top 3 males and females in both the 5K and 8K, as well as the top 3 males and females in the following age groups: 19 and under, 20-24, 25-29, 30-34, 35-39, 40-44, 45-49, 50-54, 55-59, 60-64, 65-69, 70+.